Escape the crowds of St. Thomas and venture off on a sailing cruise around the island and to some of its secluded, breathtaking locations. All day sail and snorkel with 2 other couples. We did the 2 hours sunset sail. We did the 2 hours sunset sail. I&apos;ve done this before but this time we sailed straight out, came around Water Island past Crown Bay and then cruised the harbor front. Loved it!!! Our half-day sail with the turtles excursion was FANTASTIC, the highlight of our cruise. Highlight of our trip was our excursion with Simplicity Charters. Highlight of our trip was our excursion with Simplicity Charters. Spent the day on their sailboat and it was FANTASTIC. Swam with sea turtles, delicious lunch onboard, great day. Went for a half day sail to Christmas Cove for snorkeling. From the minute we showed up till we sadly had to catch a cab back to our ship we were in paradise. We rented a 50 foot private sailboat for the day and snorkeled and went to ST Johns. Chartered a sailboat and cruised to St John&apos;s for snorkel, swim, and picnic. Chartered a sailboat and cruised to St John&apos;s for snorkel, swim, and picnic. Fabulous! Thank you captain Pam! 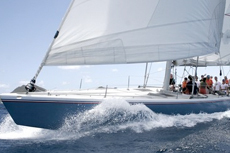 We booked through RC the Turtle Bay Sail & Snorkel Adventure - ST97. Small group Sail and Snorkel - swam with turtles and rays. Small group Sail and Snorkel - swam with turtles and rays. Very good! Absolutely the BEST sailing and snorkeling day! Absolutely the BEST sailing and snorkeling day! The Captains were a BLAST..the food and drinks on board were delicious...so so so much fun! castaway sail and snorkel on the castaway girl. castaway sail and snorkel on the castaway girl. Loved this crew!! they were very attentive and knowledgeable. Very safety conscious but made sure everyone enjoyed their time. We sailed back to the ship and wow what a fun time with the sails and music and drinks. Our favorite excursion when on St Thomas and I&apos;ll do it again next cruise. Our favorite excursion when on St Thomas and I&apos;ll do it again next cruise. Perfect day on the sailing and then and swimming moored by St. John. Loved every minute. We were fortunate in 2014 to sail with Bones twice!! By far the BEST excursion ever!!! Loved this sail all day long to St. Went on Captain Mike&apos;s the Fury. Went on Captain Mike&apos;s the Fury. Awsome sailboat ride to Buck Island where we snorkeled with the turtles. Great trip. We went back and did some shopping. One of the best stops! This was by far our favorite tour on a 1954 all wood sailboat for 6 persons. This was by far our favorite tour on a 1954 all wood sailboat for 6 persons. It was most relaxing, great staff and food, and wonderful rum punch! Couldn&apos;t have asked for a better day! Thanks Capt. Dave and Shelby! We took the Caribbean Sail to Christmas and Honeymoon Beach. Sailed on a small sailboat(High Pockets) for 6 people. This was our second trip on the Rumbaba and had a wonderful time sailing to St.